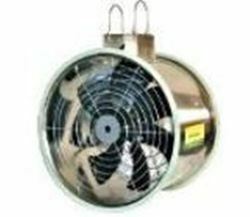 Our air circulating fans are individually tested motor for quality control.Statically and dynamically balanced Propellers.Our Every air circulating fan is individually checked for quality.Low running costsQuick and easy to installOur air circulating can be used for various applications like poultry farms, industrial building etc. The ambition of Munters is to achieve sustainable solutions that provide both environmental and economic benefits for its customers, and so, driven by the European ErP Ecodesign Directive, we have introduced the new Euroemme EDC-HE air-blowers series. We are successfully meeting the varied requirements of our clients by providing the best quality range of Farata Air Circulator Fan. S.S 310 Circulating Fan Used in Furnace. Our company is engaged in offering air circulators, which are basically propeller fans belonging to the category of heavy oscillation type, with impellers possessing three blades in both pedestal and bracket types. It can be further bifurcated into wall and column mounted fans. Dimension: 40" Dia, 6" Dep.